Explore fascinating Abu Dhabi from your perfectly located hotel on the Grand Canal, before flying onwards to the gorgeous Seychelles, for a week of pure relaxation - great value for money. Fly from London to Abu Dhabi - Manchester and other departures airports are also available, ask for details. You’ll be met on arrival at Abu Dhabi airport and transferred to the Fairmont Bab Al Bahr for a three night stay. If you’d like a different duration here just let us know - we’re very flexible when it comes to your perfect itinerary! Discover modern Abu Dhabi over the next few days - there’s modern architecture, traditional markets, beaches, theme parks and malls, all easily accessible. 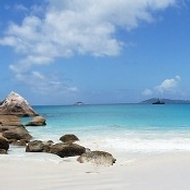 Transfer back to Abu Dhabi airport for your onward flight to the Seychelles. On arrival in to Mahe you'll be met at the airport and transferred to the Kempinski Seychelles Resort for a seven night stay. Where you stay is very flexible, so let us know what kind of hotel you’re looking for and we’ll find the best option for you! Spend the rest of your time in the Seychelles relaxing at your resort. Praslin is home to the beautiful Vallee de Mai Nature Reserve, known for its unique coco de mer and vanilla orchids. Return transfer to the airport for your return flight the UK.